Heat oven to 450°F. Spray 18x13-inch rimmed sheet pan with cooking spray. 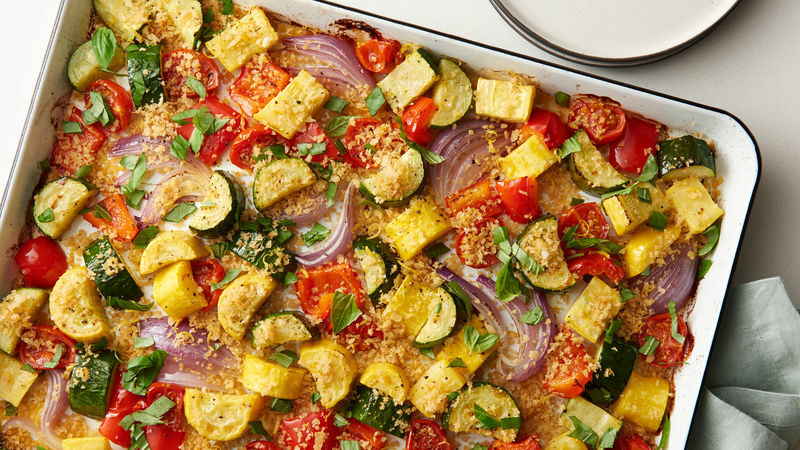 On sheet pan, combine zucchini, summer squash, bell pepper, onion and tomatoes. Drizzle with 2 tablespoons of the oil, 3/4 teaspoon of the salt and the pepper; toss until vegetables are coated. Roast uncovered 25 to 30 minutes, stirring after 15 minutes, until vegetables are tender and just start to brown. Meanwhile, in 8-inch skillet, heat 1 tablespoon of the over medium heat. Add garlic; cook and stir 1 minute. Place garlic in small bowl. Add remaining 1 tablespoon oil to skillet; heat over medium heat. Add bread crumbs; stir to coat. Cook and stir 2 to 3 minutes or until lightly browned. Spoon into bowl with garlic. Add lemon zest and remaining 1/4 teaspoon salt; stir to mix. Sprinkle bread crumb mixture and basil over roasted vegetables. Using high, dry heat roasting concentrates flavors and brings out the natural sweetness in vegetables. Chopped basil tends to turn dark over time, so it’s best to chop the basil just before serving.